How many times can I use the Reset Key? | WIC Reset Utility. Reset the Waste Ink Pad Counters by WIC. Reset Key is for One Reset only. After the reset has been performed the Reset Keys status changes to “used”. 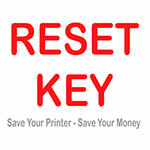 Each time You want to Reset Waste Ink Counters – You have to use unused Reset Key. You can check Reset Key status any time You want. See video tutorial How to check Reset Keys status?